The warning signs aren’t the first thing passersby notice at the Central Park Lake in Manhattan. The odd color draws the most attention. The algae bloom that covers the lake is not only an unsightly color — it sometimes smells like a septic tank and is dangerous to wildlife. The New York City Department of Parks and Recreation wants to use an experimental treatment in local ponds next year to try to prevent another one. 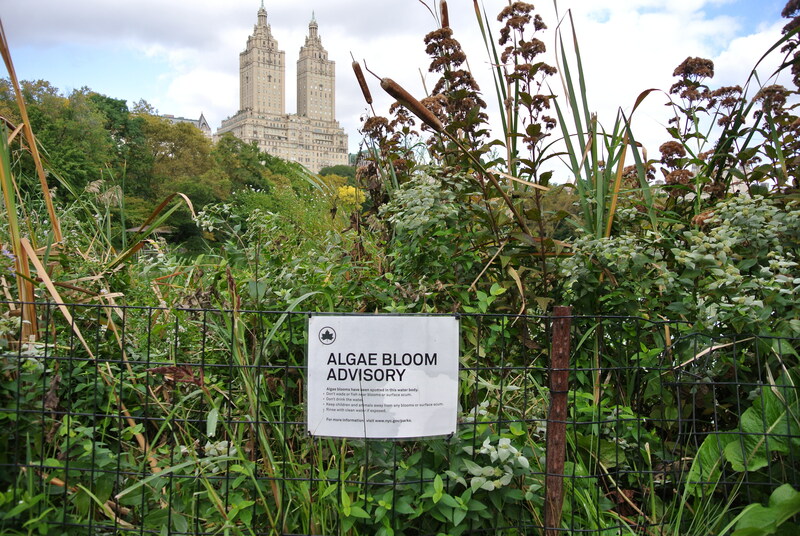 The city parks department is planning to ask state environmental regulators for permission to place bundles of dry barley straw in select algae-choked city ponds, according to Nadya Ali, an environmental analyst at the New York City Department of Parks and Recreation. The New York State Department of Environmental Conservation hasn’t yet received a formal request from the city, but informal discussions are underway, says Kevin Frazier, a spokesman for the state agency. Last summer, out-of-control algae blooms killed fish in three New York City park ponds: Indian Lake and Van Cortlandt Lake in the Bronx and Prospect Park Lake in Brooklyn. And this is not just a problem for fish — at least three dogs died in New York State in 2015 from exposure to toxic pond algae, according to Ali. Up to now, the city has responded to the algae blooms by posting warning signs and trying to reduce the levels of algae-feeding phosphorus in the pond. The parks department has tried keeping border collies to chase away geese from areas such as Governors Island, as goose droppings contain phosphorus. Barley straw could be another easy and cheap prevention strategy — if it works. The evidence for barley straw is mixed. After the city of Bloomington, Minnesota treated 11 ponds with barley straw in 2011, the amount of algae in all 11 ponds decreased. However, some studies have shown that the effectiveness of this treatment varies based on the type of algae in each pond, while others suggest it doesn’t work at all. “We still hear claims of success when using barley straw, but the ability to consistently repeat these successes is still lacking,” says Michael Netherland, an invasive plants researcher at the U.S. Army Engineer Research and Development Center. Scientists aren’t sure why submerged bags of dry barley straw sometimes appear to keep algae at bay. In 1997, scientists showed that the rotting barley straw creates phenols, chemicals with disinfecting properties that are used in some cleaners. However, wheat and other straws also produce phenols, but do not have the same effects on algae, according to a 1990 study. Newer research shows that the barley straw releases chemicals which foster microbes that inhibit algal growth, according to Christopher Winslow, an invasive plant species researcher at Ohio’s Sea Grant College program. Scientists have identified all the chemicals that barley straw produces as it decomposes, but they are not sure exactly which chemicals feed the algae-inhibiting microbes. Barley straw doesn’t kill algae already in a pond, but it does prevent new growth, according to the U.S. Environmental Protection Agency (EPA). The EPA has not yet put barley straw through the tests and registration process necessary to allow people to market it as an algaecide or an algistat, which is a substance that prevents algae growth. Preventing algae blooms isn’t only the job of public agencies — regular citizens can help, too. Since algae bloom is caused by an excess of nutrients such as phosphorus, park-goers can help by not feeding geese, according to Ali. Since phosphorus in fertilizers can run into lakes and streams, gardeners can help by using phosphorus-free fertilizers. Saving water helps, too, since water from wastewater treatment plants can also end up in ponds and streams, according to Winslow. Maybe next year, he’ll be right.